Adam Le Fondre says Wigan Athletic is the perfect club for him to kickstart his career. The much-travelled striker joined Latics just before the transfer deadline on a season-long loan from Championship rivals Cardiff. Le Fondre is closing in on a double century of career goals, but mustered only three last term on loan at Wolves. 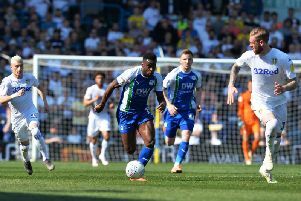 However, he scored on his only Latics start so far – a 2-1 win over, ironically, Wolves – and is confident there’s more to come based on the creativity around him. “That was one of the attractions of coming to Wigan, to be honest,” he told the Evening Post. “They’re a team that will always create chances, and I’m obviously going to score goals because I’d back myself every time in the box. Le Fondre also sees the presence of of fellow striker Will Grigg – scorer of 34 goals in his 55 Latics appearances – as a positive rather than a negative. “I’m relishing the competition,” he added. “I’ve always played in teams that have had good strikers around. “I don’t think anyone in this team is assured of their place – you have to bring your A-game every week or else you could get chopped. “That’s the life of a striker at every club in the Championship and Premier League. Latics signed off for the international break on a high, with the win over Wolves being followed by a fine goalless draw on the road at in-form Brentford. “We didn’t bring our A-game, but we made sure we ground out a result – which we haven’t been doing,” Le Fondre added. Meanwhile, the visit of Newcastle has been put back 24 hours to Wednesday, December 14 (7.45pm) for Sky TV.